Long dark wing like valves extend from hinge. 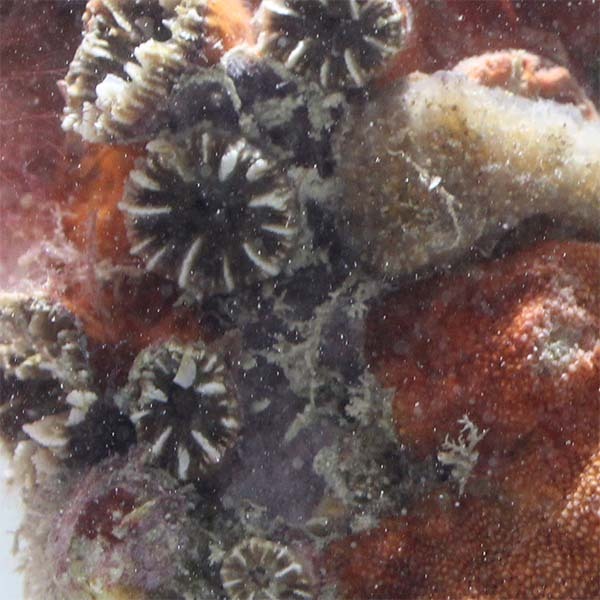 Numerous scattered spines cover surface, shells vary in color from white, yellow, orange, red and purple but generally overgrown by other organisms. 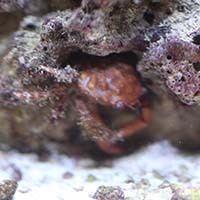 Mantle red, orange or white with white to pinkish tentacles, white valves of unequal size sculpted with small uneven radiating ribs. 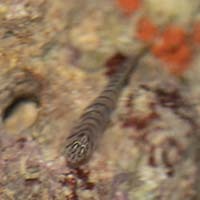 Small, reddish to orangish brown with pale banding across the arms, skin texture smooth. The conical shell resembles a pyramid. 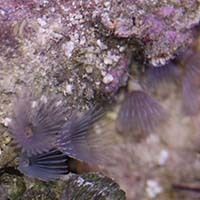 Moves freely over rock or shell as it grazes on algae. 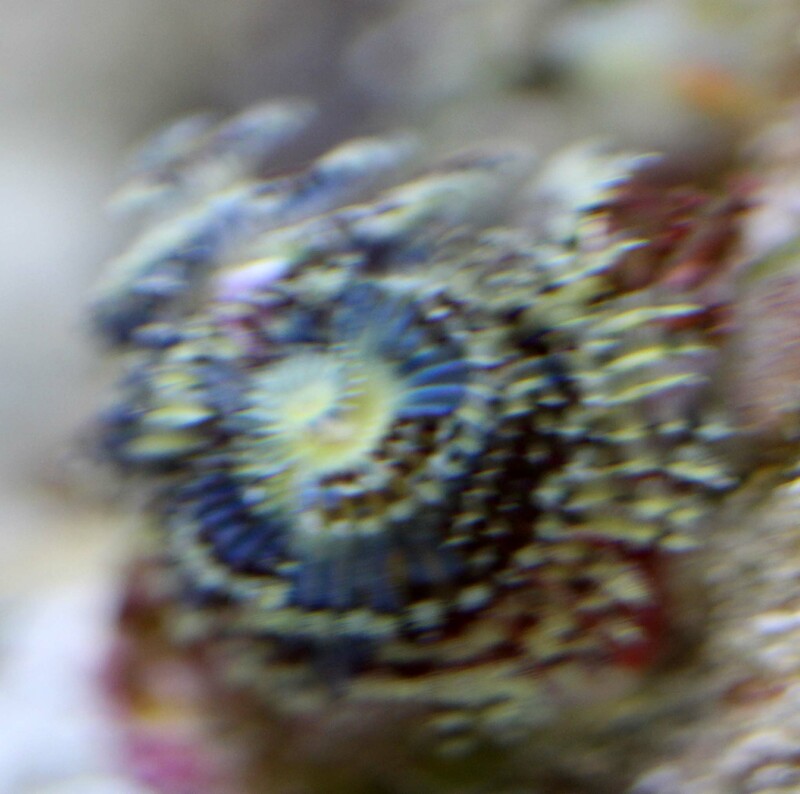 High conical shell with 7 to 8 whorls, irregular axial ribs form knobs on the shoulders, often encrusted with coralline algae. Numerous thin tan, slightly raised and occasionally beaded ribs separated by well-defined chocolate brown lines, occasional reddish orange highlights. 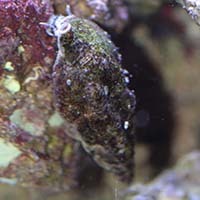 Yellowish brown shell with white and brown blotches, occasionally encircled with several lines composed of dashes and wide pale bands. Shell with 3 prominent rows of leaf like projections. Low conical spiral with nodules on the shoulder of each whorl, long oval aperture with slightly twisted canal. Spindle shaped shell gray, green or brown with thin dark spiral stripes and longitudinal lines often with black or tan blotches. Body red brown or black with white speckles. It has ten whorls, and its shoulders bear large, low nodules. The operculum is a leathery brown color, the aperture is orange, and the animal itself is brick red in color. 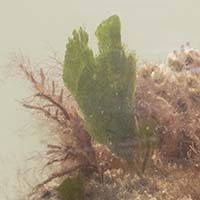 Distinctive translucent bulb-shaped tentacles tipped with thin elongated curling tips, bands and shades or green tan and white. Stubby branching pseudotentacles with prominent nematocyst-bearing knobs, shades of brown to gray to blue-green with lighter markings. 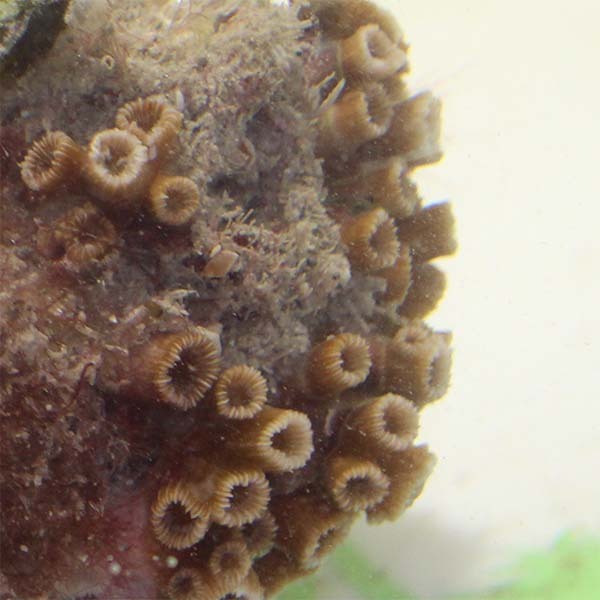 Numerous long thin translucent gray or greenish tentacles with whitish corkscrew like markings. Colonies form small densely branching clumps. Branches have fine ridges running their length, and each ends with a singular corallite. Tan to golden brown and dark brown. 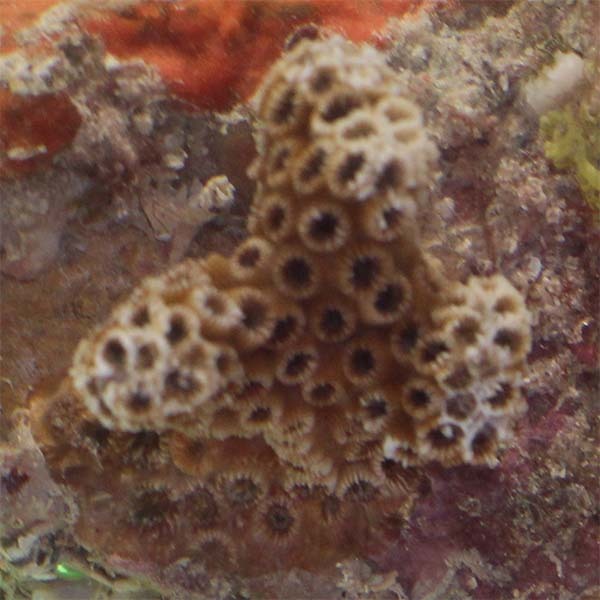 Colonies form small encrusting groups of polyps. Six protruding primary and six somewhat smaller secondary septa around the rims. Brown color ranging from yellow-brown to brown to red-brown. Brown to yellow-brown to gray and green. Ridges and valleys often contrasting shades or different colors. 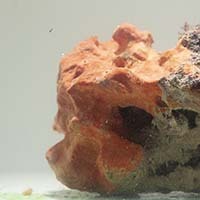 Bright Red to Reddish Brown encrusts and bores into coral heads and rocks. 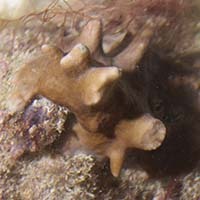 Brown yo Tan to Black encrusting sponge, appearance often resembles a flow of viscous material. Surface smooth with occasionally a single small hole. The consistency is tough, rubbery, very slightly compressible. Porous bright orange encrusting sponge. This sponge ranges in color for Yellow to Green to Brown and Tan. It has large lobes with numerous pits and ridges over the surface. 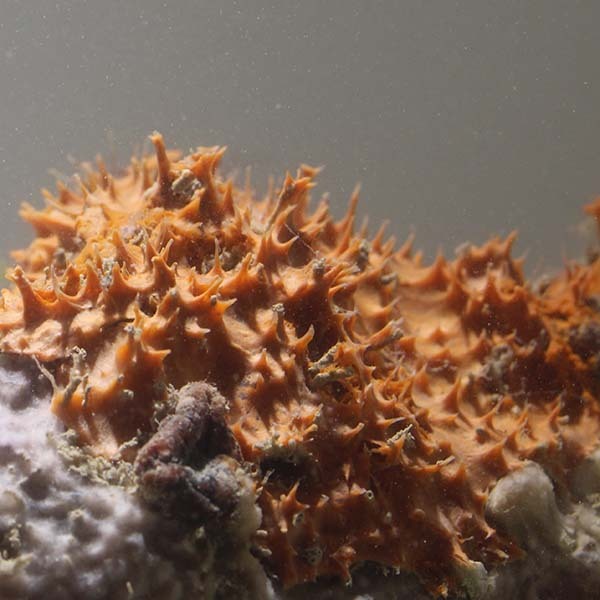 Thin encrusting red, blue lavender or gray sponge with star shaped canals radiating from exocurrent openings. 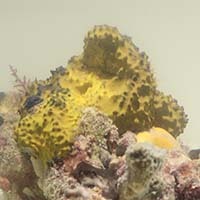 Tan colored cup-shaped sponges, although asymmetrical specimens with a lower and a higher cup-wall are common. 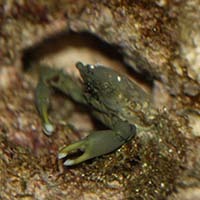 Tan to red carapace and walking legs often covered with sponge and algae, first section of stout claw arms heavily spined, tubercles around eyes. Olive green carapace and appendages back covered with smooth round nodules, walking legs heavily bristled. Shiny oval carapace with three forward angling groves orange, brown, red to olive bristled walking legs, stout claw arms. Pale blue ridgid carpace, claw arms and upper legs with red-brown markings forming wavy tranverse linines, lower legs banded. Smooth shiny brownish carapace with numerous small blue spots, upper walking legs have spines bristles and reddish joints, claw arms blue with red highlights, red claw tips. 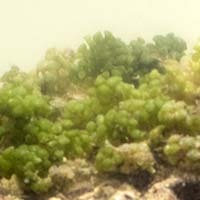 Because of extensive covering of organisms it is difficult to identify species. Triangular tan to red or brown carapace with indentation on each side behind the eye, two indentations on rear carapace body typically covered with decoration. Small translucent tan with bristles on equal size claw arms with brown reticulated pattern, pale eyestalks with brown band near the base and another just below the cream colored eyes. Green to gray with light and dark banded arms. Large numerous thin arms extend out at night to form a plankton net. Colors range from Tan, to orange to brown. Grow in clusters, crowns extend from exposed parchment like tubes, circular crows white, tan, brown or purple often two toned with dark centers. Two spiraling crowns or radioles; double horned operculum extends from between the radioles, calcareous tube with large spike like protrusion. Highly variable colors and markings. 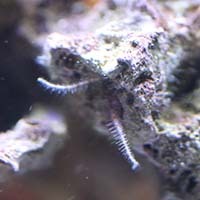 Mouth surrounded by 8 long highly branched tentacles and a single short pair. White with brown or maroon. Thick profusly branched clumps of rounded three lobed or ribbed leaf like segments. Dark to bright green and yellowish green. Small flat elongated blades with short cylindrical stalks. Grow upward from long cylindrical runners. Shades of green.